known as "Morden Map Cards" or "Counties of England and Wales". 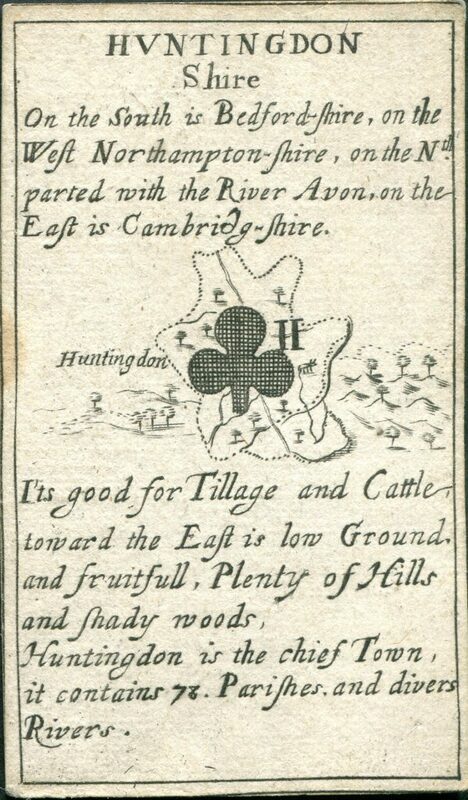 From a pack of cards by Robert Morden known as “Morden Map Cards” or “Counties of England and Wales”. Robert Morden was located at The Atlas, Cornhill, London. This is the Two of Clubs for the County ( Shire ) of CUMBERLAND. 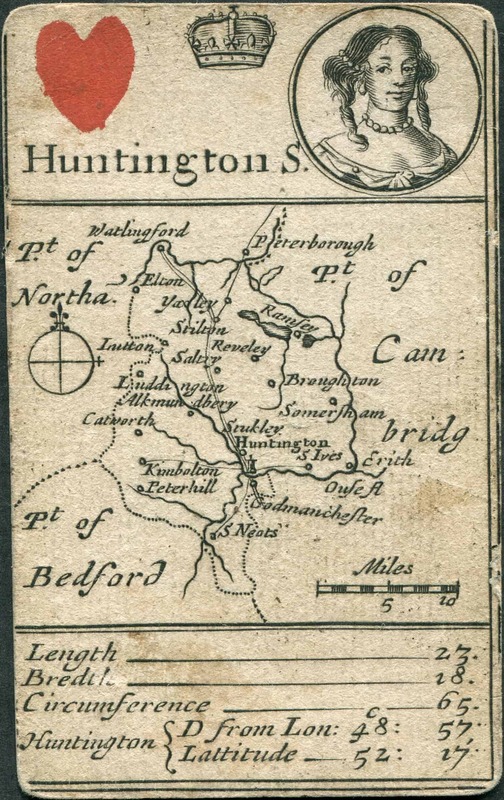 The card shows the County with principle towns and features but without the named bordering Counties. It lists the Length’ Breath, Circumference and Distance from London as well as the Latitude. The card is engraved with Black Stencilled Suit Sign ( Spades ) with double lined border. 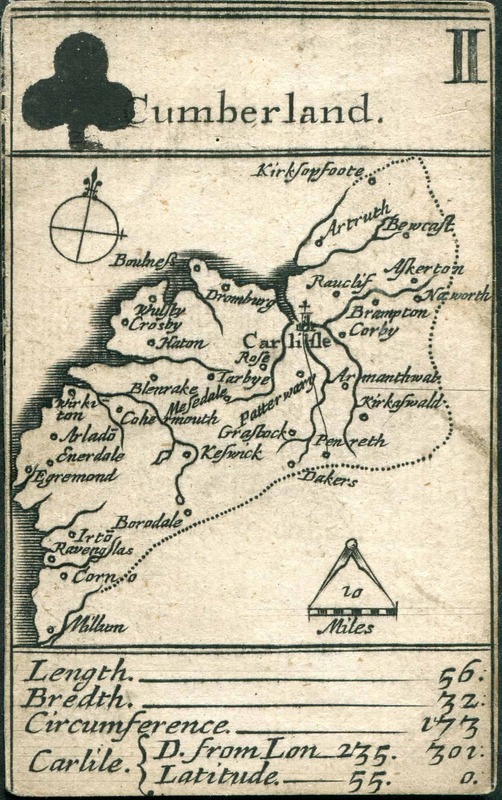 From a pack of cards by Robert Morden known as “Morden Map Cards” or “Counties of England and Wales” – this is the second state of printing showing the names of adjacent counties which was not included in the first printing of May 1676. This is the Queen of Hearts for the County ( Shire ) of HUNTINGTON. The Queen is supposed to be to the likeness of Catherine of Braganza and this likeness appears in the top panel with a Royal Crown centred in that panel. The card is engraved with Red Stencilled Suit Sign ( Hearts ) with double lined border. From a pack of cards known as the “REDMAYNE cards” this is the 1677 version where the suit signs are engraved and cross hatched, for black suited cards. Cards details location of the County in relation to other Counties and describes what the County produces i.e. “good for Tillage and Cattle…“. The card is engraved with a single line border and is in very good condition. From a pack of cards known as the “REDMAYNE cards” this is the 1677 version where the suit signs are engraved vertically, for red suited cards. 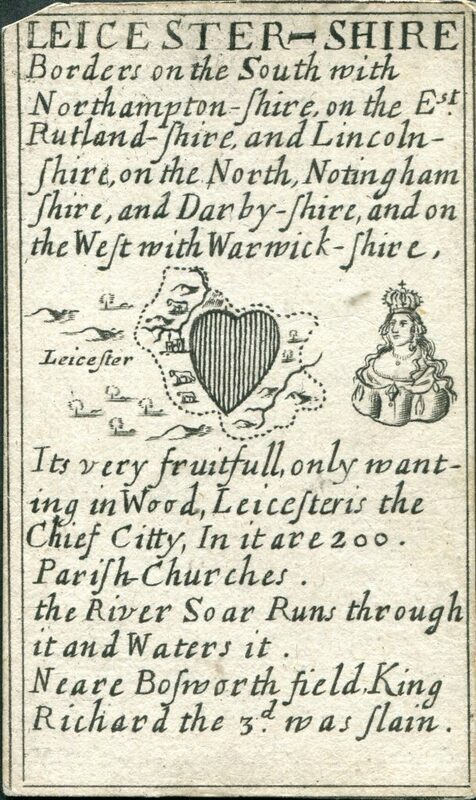 This is the Queen of Hearts for the County ( Shire ) of LEICESTER. Cards details location of the County in relation to other Counties and describes what the County produces i.e. “Its very fruitful only wanting in Wood…“. The card is engraved with a single line border and is in very good condition, small left hand corner piece absent. 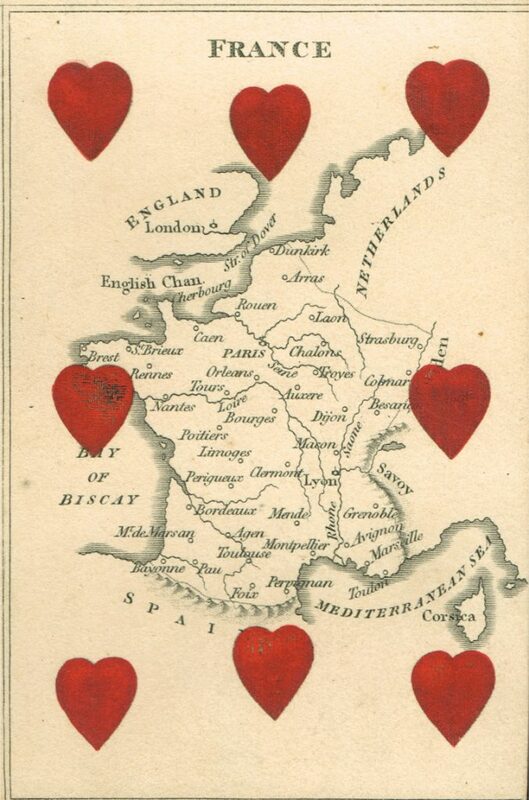 1828 Map of France on a Playing Card. From the Court Game of Geography, a pack of Playing Cards, published by Charles Hodges of Portman Street, London; Card Maker to His Majesty. 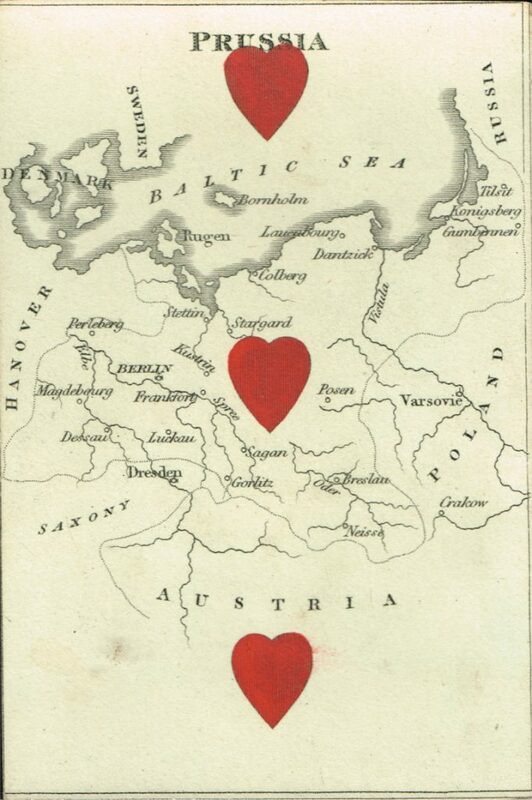 This card, eight of hearts, reflects France’s position bounded on the north by the English Channel and the Netherlands, on the east by Italy, Switzerland and Germany, from which it is separated by the Rhine. On the south by the Mediterranean and Pyrennean Mountains and on the west by the Bay of Biscay. The card measures approx: 65mm by 98mm. 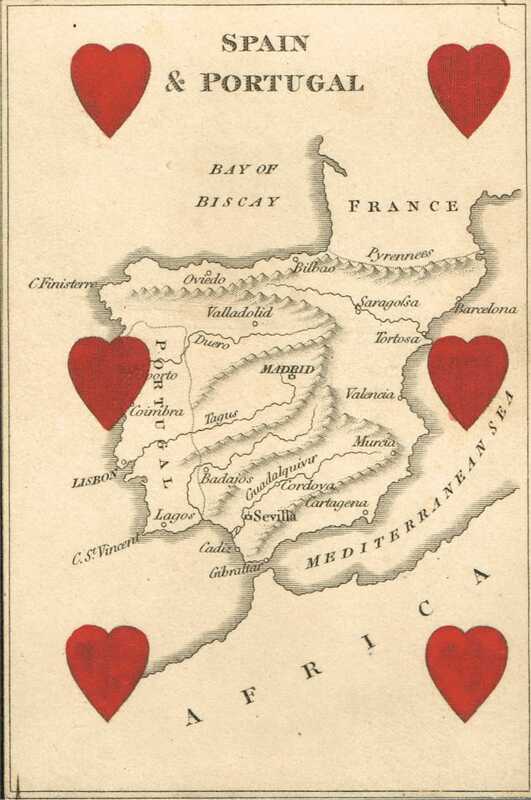 1828 Map of Spain & Portugal on a Playing Card. Portugal, the most westerly kingdom in Europe is bounded on the south and west by the Atlantic Ocean and on the north and east by Spain. 1828 Map of Prussia on a Playing Card. 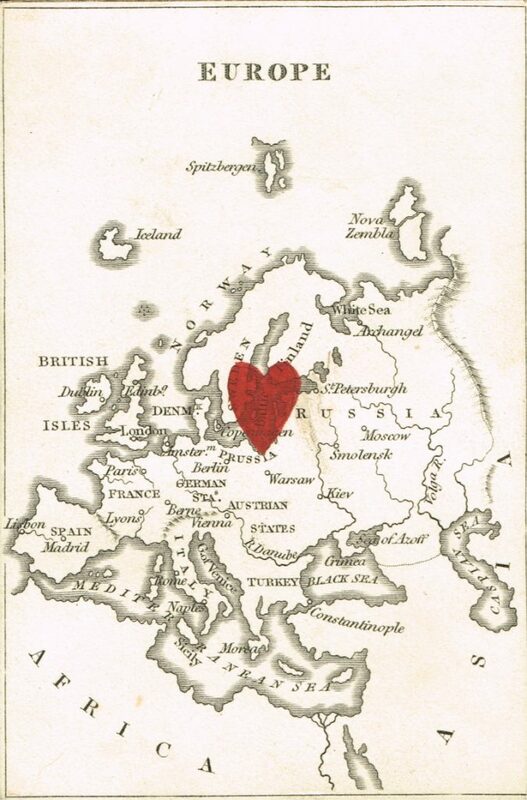 Prussia is bounded on the north by the Baltic Sea and the Russian Territories. In the east by Lithuania, in the south by Great Poland and Silesia and on the west by Brandenburgh and Pomerania. 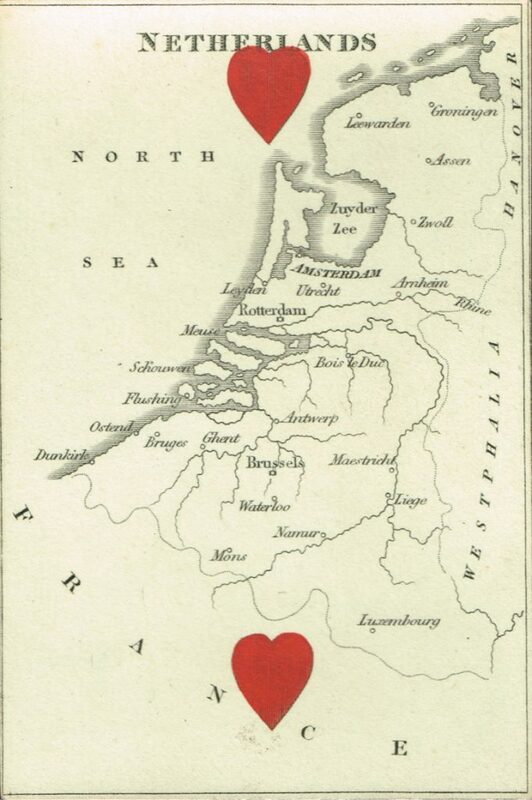 1828 Map of NETHERLANDS on a Playing Card. The Kingdom of The Netherlands comprises the Belgian Provinces and Holland. It is bounded on the north and west by the German Ocean, on the east by Hanover and in the south by France. Europe is bounded in the north by the Frozen Ocean, in the east by Asia, on the south by the Mediterranean Sea and in the west by the Atlantic Ocean. It is 3,000 mile from Cape St Vincent to the mouth of the river Oby in the north east and 2500 miles broad from north to south. 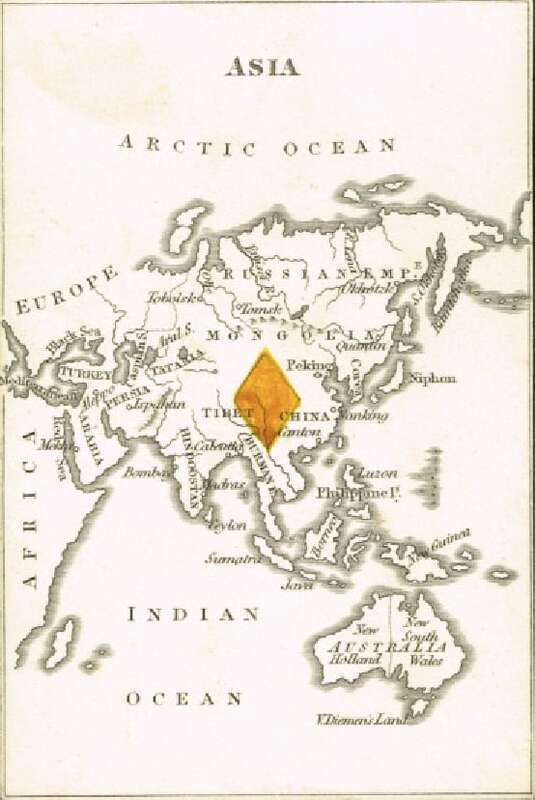 1828 Map of ASIA on a Playing Card. The Continent of Asia is situated between 27 and 190 degrees of East, or 170of west latitude and between the Equator and 78 degrees of north latitude.